Delegates from the Novosibirsk State University of Economics and Management, Russia collaborate on potential partnerships with MANCOSA and Ethekwini Municipality. The culmination of MANCOSA’s academic year and the student study cycle – graduation. Over the last 10 years MANCOSA has made dreams come true for over 11500 students! The Management College of Southern Africa (MANCOSA) is a private higher distance education institution, established in 1995 as a post-apartheid empowerment institution offering affordable and accessible management education primarily to persons previously denied access to postgraduate education in South Africa. In 2002, MANCOSA received accreditation for its programmes from the Higher Education Quality Committee (HEQC), the quality committee of the Council on Higher Education (CHE) in South Africa. MANCOSA is a leading provider of management programmes through supported distance learning in Southern Africa. It has in excess of 12 000 students currently enrolled on its programmes. MANCOSA has extensive experience in working with a wide range of students over the past 22 years in delivering high quality management and education programmes offered locally and internationally. Its flagship programme, the Master of Business Administration (MBA) degree has been offered since 1995. 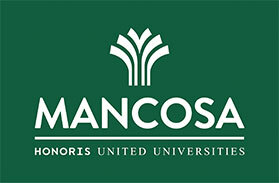 Between 1995 and 2000 MANCOSA provided management programmes in association with the Buckinghamshire Chilterns University College (BCUC), a College of the University of Brunel in the United Kingdom. During this 5-year period, MANCOSA successfully delivered tuition support to over 860 students enrolled on the Buckinghamshire Chilterns University College management programmes. At that time, MANCOSA was successfully quality assured by the Quality Assurance Agency for Higher Education of the United Kingdom (QAA). MANCOSA’s partnership with BCUC in offering management programmes and the MBA provided an international perspective to students in the Southern African region, whilst maintaining a strong local and regional focus. From the year 2000, MANCOSA discontinued offering BCUC qualifications and started to award its own qualifications which were registered and accredited in South Africa. In delivering its range of management education programmes to a diverse body of students from both the public and private sectors, MANCOSA has considerably developed its infrastructural, academic and intellectual capacities. Drawn from commerce, industry and academia, the programmes have access to a large group of high quality academics, supervisors and mentors in management and leadership. During October 2014, MANCOSA formally opened its Graduate School of Business [GSB] in Durban. The vision behind establishing the MANCOSA [GSB] was the creation of a niche campus focusing exclusively on postgraduate education in business management with emphasis on the promotion of international collaborative higher education; international study tours; executive education and research. In addition to international benchmarking activities, the graduate school of business campus was envisaged to promote programmes relevant to postgraduate business education, hence the creation of the MANCOSA [GSB]. The intention is to allow for a differentiated student learning experience between postgraduate and undergraduate education and the MANCOSA [GSB] will enable this to happen. Many postgraduate students hold senior positions in industry and a differentiated learning experience through the MANCOSA [GSB] is appropriate. The MANCOSA head office, based in central Durban, has a large complement of full-time academic, administrative and student support staff. It also has a well-resourced and modern infrastructure, training facilities, library and ICT infrastructure and equipment to complement its high quality programmes and executive education programmes. As a leading provider of management programmes through supported distance education, MANCOSA has considerable expertise in the design and development of high quality and relevant study materials. It has developed appropriate teaching and learning strategies, particularly suited for transferring knowledge and skills to mature students, many of whom are in full-time employment. Through its active research focus, MANCOSA remains at the cutting-edge of the latest management and leadership training trends. The management and staff of MANCOSA are supportive of and actively involved in both public and private initiatives to improve the South African and continental higher education sector. Developed in pursuit of the institution’s mission to empower people by providing opportunities to advance their careers, MANCOSA programmes are designed to promote high levels of independence through innovative learning and assessment interventions. The range of programmes listed below allow for students to articulate into a number of career pathways. MANCOSA is a registered and accredited higher education provider with experience in the development and delivery of management and other programmes. Currenlty the institution has 36 accredited programmes ranging across business, management and economic studies with a new branch into education studies. MANCOSA programmes are affordably priced and highly accessible in and around Southern Africa, Mauritius and Russia through the delivery of supported distance education. MANCOSA maintains that success at the workplace depends on a combination of theoretical understanding and practical application. The programme content and associated assessment interventions of the programmes develop critical thinking and problem-solving skills. This approach ensures that students realise their true potential and attain graduate attributes that contribute meaningfully to the socio-economic needs of their country. Employers benefit from MANCOSA programmes because its graduates have developed values and attributes which are personally and professionally valuable and are well-equipped with knowledge and skills to add value to their organisations. MANCOSA has a strong full time and adjunct academic work force with global teaching experience, industry leadership, significant research profiles and a track record of global education delivery across cultures and regions. MANCOSA has in excess of 6100 square metres in teaching and learning space over three campuses in the city of Durban. The campus has 2 state of the art libraries with approximately 20 000 titles and laboratories equipped with computers and laptops. MANCOSA recently opened its state of the art campus in Johannesburg which occupies over 2300 square metres of space in the education hub of the Gauteng Province.